In the spirit of martial arts this past week Poughkeepsies Precision MMA has played host to several world class competitors in several different martial arts. These guest athletes are athletes that our head coach Brian McLaughlin has trained extensively with in his own martial arts journey. The first of our guest athletes was King of Pancrase Andy Main who joined us Tuesday for some rounds of boxing against one of the Hudson Valley’s finest boxers Paul Maley. Andy also participated in our jiu-jitsu class that evening, providing a stern test for advanced students and a good learning experience for new comers. Judo is known as the art of the gentle way and for Precision Boxing and MMA offers one of the finest programs in the Hudson Valley MMA scene. Our guest instructors for the week were Jerry Fokas and Sergey Fedotov who were here for our Wednesday night judo and jiu jistu class. Sensei Jerry Fokas earned his black belt at the age of 14 and his 3rd degree black belt when he was 19. He was also a member of the Dutch National Team and a Champion for the Dutch National Military team. Sensei Sergey Fedotov has been a practitioner of the art of the Gentle way for 15 years and for 10 of those he was a black belt. Both were here showcasing their vast knowledge of judo to a packed class of eager Hudson Valley MMA students. If you are interested in checking out these awesome classes with any of our home instructors and guest instructors in our new and improved location free for 30 days call 845-392-8495 or visit http://www.poughkeepsiemixedmartialarts.com to get started! Precision Boxing & MMA New Location! The biggest MMA school in the Hudson Valley just got BIGGER! Precision Boxing & MMA has moved 5 miles down the road into our new location in the Plaza 44 shopping center at 51 Burnett Blvd. in Poughkeepsie, NY. 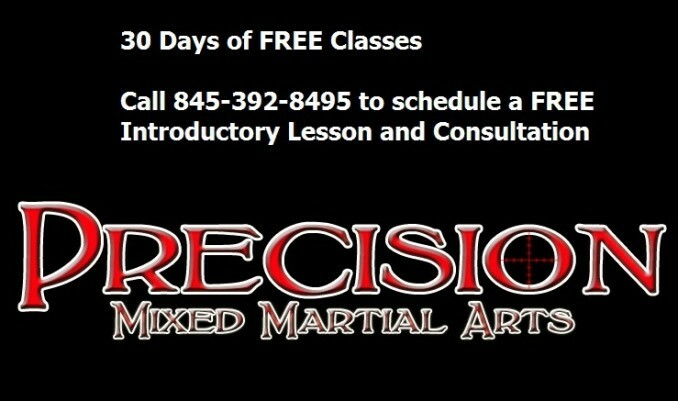 Check out the improved location free for 30 days call 845-392-8495 or visit http://www.poughkeepsiemixedmartialarts.com to get started!